Do we already have a thread about this? If so, please disregard after giving me the link. ==A European probe awoke from a deep sleep Monday to gear up for an unprecedented comet rendezvous and landing this year that will cap a 10-year voyage across the solar system. After two and a half years in hibernation, the European Space Agency's Rosetta spacecraft emerged from its slumber while cruising nearly 418 million miles (673 million kilometers) from the sun. The wakeup call, which was due to begin at 5 a.m. ET (1000 GMT), took hours as Rosetta switched on heaters to warm itself after its long night in the cold depths of space. "We made it!" Andrea Accomazzo, Rosetta's spacecraft operations manager, shouted in exultation in a webcast. "We can definitely see a signal from Rosetta!" [+5] - Lordyaswas - 06/17/2015Are the rumours true that McDonald's are sponsoring another mission to join up with Philae on that comet, and that their craft is going to be called 'O Fish' ? Sorry. That’s when the European Space Agency will try to land its Philae spacecraft on the surface of a comet. It’s the first time humans have ever attempted a soft landing on a comet and I’m thrilled to see what’s going to happen. With that in mind here’s a guide to watching the event. The most interesting time will be from 8:00 a.m. to 10:30 a.m. CT on Wednesday. After this time the lander should begin to send signals back to Earth, including images from the comet’s surface. DARMSTADT, Germany (AP) — The European Space Agency said it landed a spacecraft on a comet Wednesday for the first time ever. The Philae craft pulled off the audacious landing hours after it was released toward the giant ball of dust and ice by the unmanned Rosetta space probe. The landing is the highlight of a decade-long mission to link up with comet 67P/Churyumov-Gerasimenko. After analyzing telemetry data from the Philae lander, ESA says it seems that the craft's harpoons didn't fire as first thought. Adding that the lander is in "great shape," the agency says its engineers are looking into options for retrying the harpoon operation, which is meant to secure the craft to the comet's surface. In a tweet, the agency says the lander "made a fairly gentle touch down on #67P based on amount of landing gear damping." 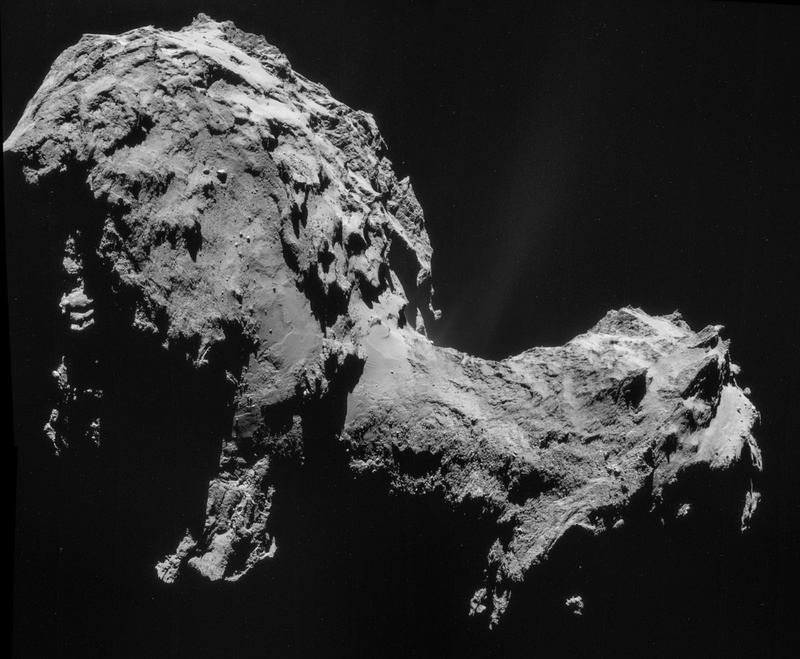 In a first, the Philae lander is on the comet's surface. We've updated the top of this post to reflect the news. "Everything looks really, really good," says Stephan Ulamec, Philae program manager at DLR, in a progress report. The ESA has released new images from the area around the comet, including one shot of Philae breaking away from the Rosetta craft and heading toward 67P. Another image shows the lander from the view of its parent spacecraft. The two scientists who discovered the comet 45 years ago — Klim Ivanovych Churyumov and Svetlana Ivanovna Gerasimenko — are in the unique position today of watching humanity's attempt to land on it. Churyumov and Svetlana Ivanovna Gerasimenko took part in an event hosted by the ESA that was equal parts news conference and viewing party. When Gerasimenko was asked the tongue-in-cheek question of how she likes the comet that she and her colleague spotted decades ago, she responded by saying, "I like the form very much — it reminds me of a boot." Today's comet operation was also being monitored by other space veterans. It looks disturbingly like an adapted condenser from an air conditioner. London (CNN) -- The comet probe Philae may have bounced when it landed, the European Space Agency (ESA) said Wednesday. It is the first time a soft landing has been achieved on a comet -- but there was a hitch. Comet 67P has a very weak gravity, so anchoring harpoons were designed to shoot into the comet to fix the spacecraft to the surface. They failed to fire and Philae is not firmly secure, ESA says. Philae lander manager Stephan Ulamec said the probe may have lifted off again and turned. "So maybe we didn't land once -- we landed twice," he told a news conference. "Did we land in a soft sand box or is there something else happening? We don't fully understand what happened," he said. Ulamec said scientists remain upbeat as they are still receiving data from the spacecraft and they hope to learn more Thursday. Shortly after landing was confirmed, the probe tweeted: "Touchdown! My new address: 67P!" Later, it tweeted again: "I'm on the surface but my harpoons did not fire." What can we learn from comet landing? Led by ESA with a consortium of partners including NASA, scientists on the Rosetta comet-chasing mission hope to learn more about the composition of comets and how they interact with the solar wind -- high energy particles blasted into space by the sun. Speaking to CNN shortly after the landing, ESA lander system engineer Laurence O'Rourke said they were trying to check the orientation of the craft, to see "how we landed and where we landed." "We are extremely happy," he said. "To get the signal it had touched the surface was a major achievement -- it was quite extraordinary. 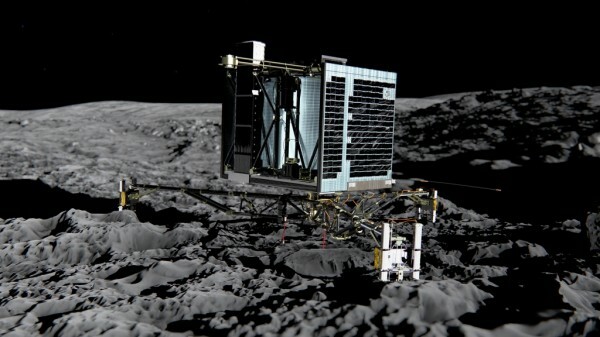 Philae is already taking measurements, sniffing the comet." He also said the probe could start drilling into the surface and analyzing the material as soon as Thursday. The comet is currently 500 million kilometers (310 million miles) from Earth and pictures from the Rosetta mission to track it on its orbit around the sun have amazed scientists. NASA's chief scientist, Ellen Stofan, told CNN: "That comet is the most bizarre, wonderful thing I have ever seen. Those images have just blown me away. Philae was such a huge success before it even did anything, so kudos to ESA and the scientific community. "No one has ever gotten data like Rosetta has gotten. No one has ever been able to land on a comet the way Philae just did." Astronomer Robert Massey also called the landing a tremendous achievement. "A comet is a bit like a time capsule, which is why it's special," he told CNN. "It's an insight into the composition of the early solar system -- the ratio of chemicals. "Even without Philae, we still have Rosetta in orbit around a comet, giving the ability to watch it at close quarters. There will be a lot of science from this," he said. Weighing in at 220 pounds, it might be the size of a domestic washing machine but Philae is considerably smarter. It is equipped with an array of experiments to photograph and test the surface of Comet 67P as well as finding out what happens when the roasting effect of the sun drives off gas and dust. What is a comet? Could Rosetta unlock Earth's secrets? Built by a European consortium, led by the German Aerospace Research Institute (DLR), the landing probe has nine experiments. According to details on ESA's Rosetta website, sensors on the lander will measure the density and thermal properties of the surface, gas analyzers will help to detect and identify any complex organic chemicals that might be present, while other tests will measure the magnetic field and interaction between the comet and solar wind. Philae also carries a drill that can drive 20 centimeters (8 inches) into the comet and deliver material to its on-board ovens for testing. Scientists are already pleased with progress of the mission. ESA project scientist Matt Taylor said: "The orbiter will remain alongside the comet for over a year, watching it grow in activity as it approaches the sun, getting to within 180 million kilometers (112 million miles) in summer next year, when the comet will be expelling hundreds of kilograms of material every second. "It's got an awesome profile -- the adventure of the decade-long journey necessary to capture its prey, flying past the Earth, Mars and two asteroids on the way," he said. Daniel Brown, an astronomy expert at Nottingham Trent University in the UK, said: "Although we have landed on planets, moons and asteroids, it has never been attempted for a nucleus of a comet -- and with good reason. These objects have a very low gravity, are loosely composed of ice, dust and rocks, and are very irregular in shape. They are temperamental in their behavior and notoriously difficult to predict. "Comets such as 67P have already been exposed to the intense heat of the sun in their past orbits, resulting in their surface being altered, but going beneath the surface will give us an insight into unchanged material, allowing us to peak into the chemical composition of our early solar system. "Apart from the amazing scientific results, the sheer challenge and ambition of such a mission is outstanding and illustrates how our space exploration of the solar system has become more advanced and successful. It gives us much to hope for in future missions." HOW WILL THE LANDER COLLECT DATA? “The science starts the minute we get down to the ground,” said Mark McCaughrean, a senior scientific adviser on the mission. Philae has ten instruments on board — including devices to measure light, electrical magnetism and heat — and flying up above the comet the Rosetta spacecraft has another 11 instruments. The Philae lander will provide plenty of images of a world no human has ever seen close up and will drill below the surface to extract a sample of the comet that will be analyzed onboard. The lander’s batteries are expected to last just 64 hours — but that should be enough for scientists to gather a huge wealth of data. In addition, the lander has a solar panel that should provide an hour’s worth of battery life per day for up to five months. The comet is on a 6 ½-year elliptical orbit around the sun. At the moment it is getting closer to our star. This makes for great science, since Philae and Rosetta will be able to observe the comet becoming more active. As 67P approaches the sun, the amount of matter it sheds will greatly increase, posing a potential risk to the lander and even to the Rosetta spacecraft flying in tandem with the comet. As the comet reaches perihelion, the closest point to the sun, the rising temperatures could also damage Philae. But the lander should remain stuck to the comet forever, even after its systems have shut down. Rosetta will continue to fly alongside the comet until the end of its useful lifetime in about two years. Scientists have suggested that a fitting end would be for it, too, to land on the comet and reunite with the lander once more. Philae, the European Space Agency's little comet lander that could, has shown the world that a third landing – however unintended – is a charm. The craft is healthy and is returning data from the surface of comet 67P/Churyumov–Gerasimenko after sending mission scientists and controllers on an emotional roller coaster ride – one in which two key systems designed to help the craft anchor itself to the comet failed. Instead, the craft touched the surface after a seven-hour saunter from its mother ship, ESA's Rosetta comet orbiter, and bounced twice. It finally settled in a spot where one of the lander's three feet appears to be standing on the edge of a precipice. Although it is unanchored, it's upright and has enough power to perform a programmed sequence of experiments that form the core of the lander's science objectives. Still, the science team is seeing if it needs to juggle the sequence. For instance, the lander lacks a firm anchor to the gravitationally weak comet core, so any experiment that would result in force being applied to the lander might have to wait until the end of the sequence. That way the craft can return as much data as possible from the rest of the instrument package before planners run the most mechanically intense experiments and risk inadvertently launching the craft back into space or sending it tumbling and bouncing along the surface. Moreover, images and telemetry coming in from the lander overnight suggest that it landed in a rock-shaded spot that will expose its solar panels to far less sunlight than the panels would have received at the original landing site. “We're receiving about one and a half hours of sunlight with respect to the six or seven we were aiming for,” said Kuhn Gerts, one of the specialists keeping track of Philae's systems, during a briefing Thursday. The low-light condition could prevent Philae from executing much beyond its initial 60-hour science plan, which relies on a pair of batteries in the lander to power the nine experiments onboard. The panels are designed to recharge the batteries. Yet even accomplishing the 60-hour program would yield a bonanza of new information about comets – rubble left over from the dawn of the solar system. These objects are thought to be among the construction leftovers that delivered water and organic compounds to Earth, laying the foundation for life to emerge on Earth. Ironically, Philae's sequence of bounces appears to have presented one of the first scientific surprises. The craft touched down on 67P/Churyumov–Gerasimenko at 10:34 A.M. EST Wednesday. Mission controllers quickly announced that the harpoon system – the craft's ultimate anchor to the low-density nucleus – had activated. So had several science instruments. But the data coming back from the instruments indicated that the craft was moving again. No harpoon had launched from the lander into the nucleus. Harpoon deployment would have been a challenge anyway because a thruster atop Philae that was to have counteracted the recoil from harpoon deployment wasn't working. Controllers learned that prior to Rosetta releasing the craft, but they opted to proceed anyway. Mission managers say that Philae's first leisurely bounce – with a hang time of just under two hours – reached nearly 3,300 feet above the nucleus before it returned to the surface. The second and final bounce lasted just over seven minutes. Although Rosetta has yet to spot the lander on the surface, mission officials say they suspect Philae landed just over a half a mile from its initial target. Indeed, the first landing brought the craft dead center of its landing site, a bare patch atop the smaller of the two lobes that make up the comet's rubber-ducky profile, mission officials said. The nucleus is not very dense, leading researchers to think that its surface was relatively loose and porous, with no strong crust, explained Dr. Bibring. 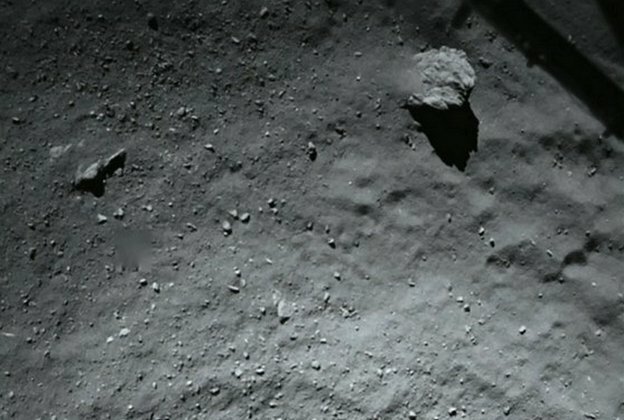 Data on the dust around the comet as well as images suggested that the dust-covered landing site would likely have a low-density, porous surface. Such a surface might still allow for a bounce, he suggested. The idea that the landing site hosts a highly porous surface built of layers of dust the comet's gravity reclaims from its halo of dust and gas, that fails to explain the rebound, he said. Why the **** did they rely on getting solar energy? Oh Ya, EU politics. This mission looks like it will be a dud because of the politically caused mistake of not using nuclear fuel. What a stupid waste. Also the whole reason this thing was put to sleep was because of power problems, power problems that they never should have had to deal with. Stupid stupid stupid. The Mars rovers rely on solar power also. Anything out there that relies on electricity needs solar power to renew the batteries. Less than two days after its historic landing, Rosetta's probe may be reaching its final hours, and the scientific team is racing to collect as much data as possible before Philae's batteries run out. It's do or die, and at this point there's very little to lose in terms of its lifespan. As the mission team announced on Thursday, Philae's bumpy landing left it in a shadowy spot. Its solar panels aren't being exposed to nearly enough light to keep the lander going, and it left Earth with only a 60-hour charge. In all likelihood, Philae's batteries will die sometime Friday evening. And no, we aren't sure where it is. "We still could not exactly identify where Philae is at this very moment," said Stephan Ulamec, Philae Lander Manager, at a media briefing on Friday morning. He and other scientists hope they'll pinpoint Philae's location with new information they'll receive Friday evening, but by then it may be too late to try to move the probe. But the probe is doing some speedy science in the meantime: In the media briefing, the Rosetta team said that several new instruments were now operational. MUPUS, which is a penetrator that hammers into the surface, was activated Thursday night. This was a controversial move, scientists worried it might push Philae into an even more precarious position. But with time running out, they made the call to turn the hammer on. Philae's X-ray spectrometer, which should reveal some clues about the comet's molecular composition, is also running. And as of the team's last contact with the probe (which is interrupted for many hours a day because of the comet's rotation), Philae's drill is also on. We don't know yet whether this tool has actually succeeded in penetrating the surface and taking samples. The next information from Philae will come around 8 p.m. Eastern time Friday, after the mission team receives its next packet of data from the satellite link. In the meantime, scientists are analyzing the last data packet -- including information from MUPUS -- as we write this. The next data packet will also include a whole host of new photos. "We're still awaiting the descent images...and the images from the first touchdown to touchdown plus two hours. These images aren't down yet," said Holger Sierks, who oversees the OSIRIS camera, at the Friday media briefing. These images are expected to show Philae's bounce, which would help the team figure out where it ended up. "So hopefully...we'll soon be in the position to know where it hides," Sierks said. It's possible that the team will come up with some way of moving the probe, but this doesn't seem to be their main concern. It's a long-shot, and their time is probably better spent doing as much science as possible before Philae dies. They may try to rotate one of Philae's solar panels the next time they have contact, but the team didn't seem optimistic about the plan during their Friday livestream. Philae isn't askew, it's upright -- so unless the team can make it bounce to a sunnier spot, nothing is going to make it get more light. The big concern right now is that Philae won't have time to analyze these new samples and send information back before its batteries die later Friday night. The data would be stored in Philae's memory, but there's no telling when, if ever, humanity would get the chance to retrieve it. "We're cutting it really close to the next link," said team scientist Valentina Lommats during the Friday briefing. It's possible that the battery won't even make it to another link-up with Rosetta, or that scientists will only have time to reach out to the probe -- and not enough for the lander to send back results.